The Child Protective Services Law (CPSL) was signed into law in 1970. CPSL provides the parameters for investigation of reports of suspected child abuse, as well as reports of children in need of General Protective Services. The PA Child Protective Services Law (CPSL) was enacted to protect children from abuse, allow the opportunity for healthy growth and development and, whenever possible, preserve and stabilize the family. 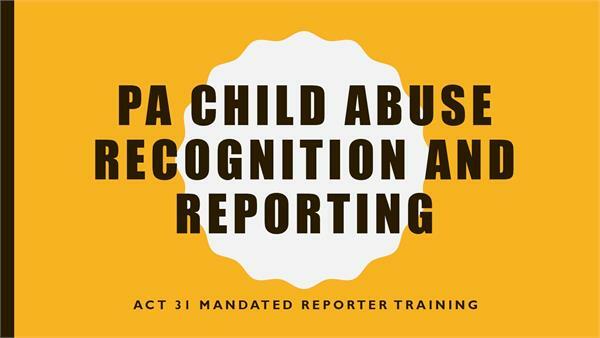 In 2014, Act 31 was signed into Pennsylvania Law - LMT's are now considered Mandated Reporters of suspected child abuse. This workshop covers all relevant material to understanding the law, your responsibilities as a mandated reporter, and the reporting process. This workshop is approved by the Pennsylvania Department of State. *Please note you will be asked to provide your PA Massage License Number, the last four digits of your social security number and your date of birth when you purchase this course. We need this information in order for us to provide proof that you have completed this class to the PA Massage Therapy Board. You will receive your login credentials after your order has been processed.